WASHINGTON — In a new study, researchers showed that using sound waves to levitate droplets of water in midair can improve the detection of harmful heavy metal contaminants such as lead and mercury in water. Detecting small amounts of heavy metals in water is important because these contaminants are harmful to human health and the environment. The new technique could eventually lead to instruments that perform real-time, on-site contaminant monitoring, which could help prevent future lead contamination problems like the Flint, Michigan, water crisis or detect contaminated wastewater from industrial sites. "Despite the large variety of water sensors that offer continual monitoring, detection of multiple heavy metals dissolved in water can only be performed by sending samples off for specialized laboratory analysis," said the research team leader Victor Contreras, from Instituto de Ciencias Físicas UNAM, Mexico. "Our new technique is one step toward the development of a simpler analysis approach that could be applied on-site and in real time. This type of water analysis could be used by agricultural, pharmaceutical, water purification and other industries to monitor water for contaminants." In The Optical Society (OSA) journal Optics Letters, the researchers detail their new approach, which uses a sensitive technique known as laser induced breakdown spectroscopy (LIBS) to analyze heavy metals present in levitating drops of water. Levitating the water droplets allows the water to evaporate in a controlled position, which increases the mass concentration of contaminants in the sample and makes it easier to perform LIBS analysis. The researchers showed that their new approach can reliably detect very low levels of the heavy metals like barium, cadmium and mercury with analysis times of just a few minutes. The researchers used LIBS because it offers a fast and straightforward way to identify several elements simultaneously. LIBS works by focusing a high energy laser pulse onto a sample, which vaporizes the material and generates a plasma. Because the light emitted by the plasma contains the atomic fingerprints of the material, it is possible to identify the chemical components of the sample by analyzing the emitted light. It is a straightforward process to use LIBS analysis on solid samples. In fact, several commercially available handheld devices are available for this type of analysis. However, it is difficult to use this method to directly analyze liquids because the plasma formed in liquids cools down faster and lasts a very short time. In addition, producing a plasma on a liquid surface produces water splashes that directly affect the spectroscopy reading. With liquid samples, creating a plasma that provides a good signal for chemical detection requires high levels of laser energy, which can only be provided by bulky, non-portable lasers. To circumvent this problem, liquid samples are typically analyzed by placing a drop on a substrate and waiting for it to dry in order to concentrate the elements of interest in the sample. Although depositing the sample on a substrate is quite simple, the laser pulse excites atoms from elements in the sample as well as from the substrate. Besides, water evaporation could lead to inhomogeneous distribution of the impurities on the substrate, compromising its signal reproducibility. 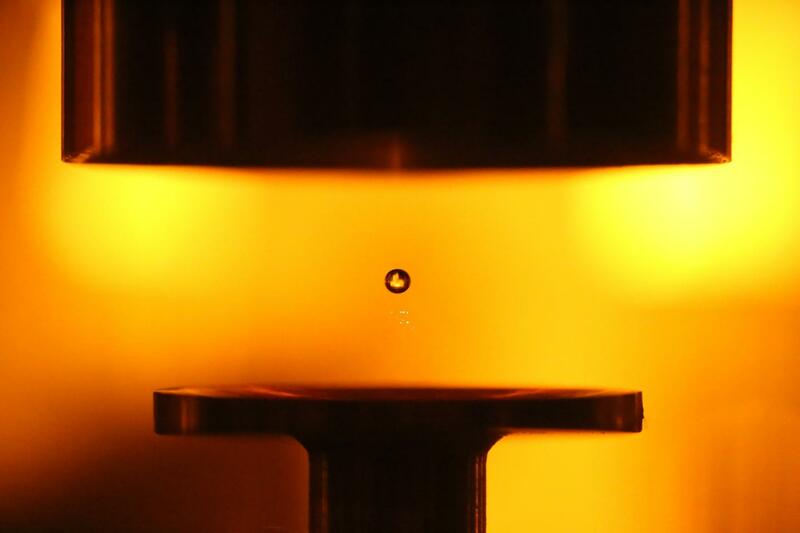 Instead of depositing the droplets onto a substrate, the researchers used intense sound waves to levitate single droplets of water. The sound waves produce a force strong enough to counteract gravity, allowing a droplet to hover unsupported in the air. In the paper, the researchers showed that using acoustic waves to levitate a single drop of water allowed them to detect very low concentrations of heavy metals. For example, they detected 0.7 milligrams per liter of cadmium and 0.2 milligrams per liter of barium. They also showed that the acoustic levitation technique they used is stable enough for reproducible LIBS analysis. "This technology has a potential to simultaneously detect heavy metals and other elements in water in a fast and cost-effective way," said Contreras. "An online analyzer based on our technology could one day help prevent environmental disasters and contribute to improved water quality control." The researchers are now working to improve the instrumentation. For example, they want to optimize the mechanical design of the acoustic trap to achieve more stable levitation conditions, which will improve the reproducibility of the LIBS readings. They also want to increase the sensitivity by stably levitating smaller drops, which further concentrates the contaminants. This is a key step toward miniaturizing the device because it will allow the use of less sensitive, but more compact detectors. Paper: V. Contreras, R. Valencia, J. Peralta, H. Sobral, M. A. Meneses-Nava, H. Martinez. "Chemical elemental analysis of single acoustic-levitated water droplets by laser-induced breakdown spectroscopy," Opt. Lett., Volume 43, Issue 10, 2260-2263 (2018). DOI: 10.1364/OL.43.002260.